On March 12, 2019, federal authorities arrested dozens of people involved in the largest college admissions fraud scam in U.S. history. Prosecutors have named 33 parents including Manuel Henriquez, Chairman/CEO of HTGC. Mr. Henriquez has voluntarily stepped aside but will continue as a member of the Company’s Board and an adviser to the Company. I sold shares in May 2017 due to Mr. Henriquez seeking externalization which was bad for the company/shareholders but excellent for Mr. Henriquez and fully supported by the Board. Diversify your BDC portfolio with at least five companies. 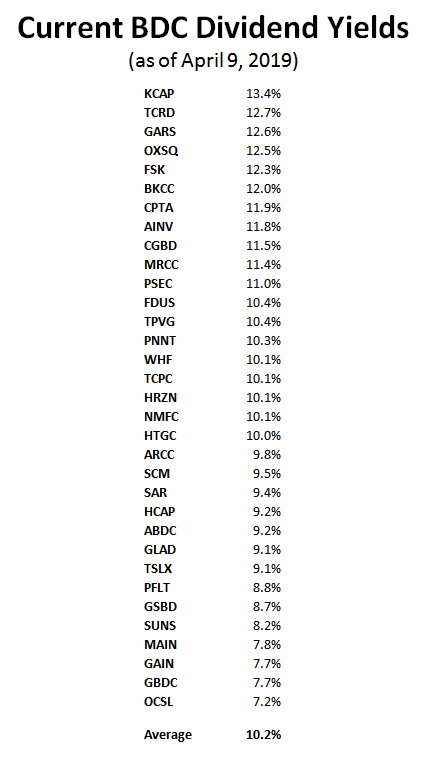 There are around 50 publicly traded BDCs; please be selective. This is a good example of why you need to diversify your BDC holdings. On March 12, 2019, federal authorities arrested dozens of people involved in the largest college admissions fraud scam in U.S. history. Prosecutors have named 33 parents (including Manuel Henriquez, Chairman and CEO of HTGC) and 13 coaches but said the investigation continues and more parents and coaches could be charged. Federal prosecutors allege that Mr. Henriquez, along with his wife, participated in the cheating scheme on four occasions for their two daughters and were charged with conspiracy to commit mail and wire fraud. Mr. Henriquez surrendered to the FBI on Tuesday and was released on a $500,000 bond following a court appearance. On March 13, 2019, HTGC announced that effective immediately, Manuel Henriquez has voluntarily stepped aside as Chairman and Chief Executive Officer. The Board has elected Robert P. Badavas, currently Lead Independent Director to be Interim Chairman of the Board and elected Scott Bluestein, the Company’s Chief Investment Officer as Interim Chief Executive Officer. Mr. Henriquez will continue as a member of the Company’s Board and an adviser to the Company. Mr. Bluestein has nearly 20 years of financial services, direct investment and credit experience. He joined the Company in 2010 as Chief Credit Officer and was appointed Chief Investment Officer in 2014. Before joining Hercules, Mr. Bluestein served as Founder and Partner of Century Tree Capital Management, a fund established to make senior secured debt investments with warrants and equity co-investments in small and micro-cap public and private companies. As mentioned in previous articles and the BDC Risk Profiles, the ‘Quality of Management’ is likely the most important part of BDC analysis as management is responsible for building a portfolio to deliver returns to shareholders while protecting the capital invested. BDC management controls all the levers including the quality of the origination/credit platform, managing the capital structure with appropriate leverage, meaningful share repurchases, accretive equity offerings and dividend policy, creating an efficient operating cost structure and willingness to “do the right thing” by waiving management fees or having a best in class fee structure that protects returns to shareholders. Also mentioned in previous public HTGC articles, including “Hercules Capital: External Management Analysis”, in May 2017 Mr. Henriquez attempted “externalization” which would have increased the overall cost structure as well as making it less scalable for future dividend increases. This likely has weighed on the stock (for fear of another attempt to externalize) and shareholder’s trust in management. The recent events did not appear to have any relation to activities at the company but will be a distraction for HTGC management and will likely impact the near term stock price. I have taken into account lower expected portfolio growth starting in Q2 2019 as well as lower core portfolio yields. However, HTGC had a $1.5 billion pipeline of potential opportunities and had been actively hiring additional personnel driving higher operating expenses in 2018. Please see the discussions below. From recent earnings call: Now, let me take a brief opportunity to discuss our views of the marketplace and activities as we enter the first quarter 2019. We remain very optimistic about what we’re seeing so far in Q1 of 2019. As we continue to be hyperly selective in evaluating and reviewing the potential pipeline that now stands at over $1.5 billion of new investment opportunities that we’re evaluating. This is above and beyond the already $345 billion of close or pending to close commitments that we already have in-house today as outlined in our earnings release this afternoon. From a previous call: In an effort to address the increasing loan demand, we’re actively expanding our offices in Boston and Palo Alto. We’re adding additional new headcounts across all levels of the company, which we expect to continue throughout the remainder 2018 and early part of 2019. We see tremendous opportunities continue to grow our loan portfolio rolling into 2019 and we want to make sure that we’re properly capitalized as well as staffed to continue to address the strong demand that we are seeing for our capital. As many readers know, I am typically a ‘Buy and Hold’ investor making additional purchases during general market/sector pullbacks and only selling if there are serious issues. I have been investing (on and off) in HTGC over the last 10 years and writing public articles on Seeking Alpha discussing the stock for over 6 years. Previously, I sold my shares of HTGC at an average price of $15.17 on May 4, 2017, due to the company seeking “externalization”. However, I have been slowly repurchasing shares including most recently on December 26, 2018, at $10.95. 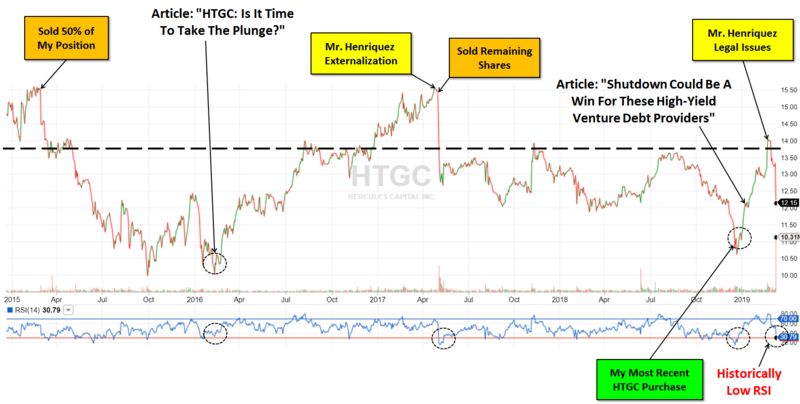 As shown below, HTGC’s stock price never recovered from its pre-externalization highs likely for the reasons discussed earlier. Yeah. If I went to the Board and expressed an intent to externalize, I would — I think I would become externalized, I expect to be terminated. And if the Board let me, I would hope that the shareholders would terminate them. Optics for investors and changes in trust of management. Reaching for yield due to a higher cost structure. 2% base management fee – the highest in the sector and much more important than the incentive fee structure. 7% hurdle rate for incentive fees – too low and not shareholder-friendly. Lack of total return hurdle to protect shareholders from capital losses – as most BDCs are headed toward shareholder-friendly fee structures, HTGC has decided to take the opposite approach. Changes to stock valuation based on lower expected dividend coverage/growth and likely higher risk profile (from increased conflicts of interest and potentially reaching for yield). 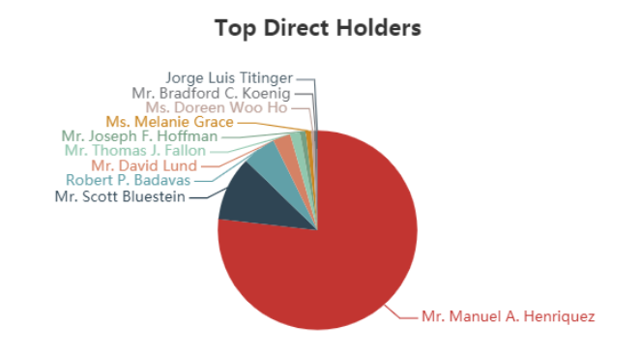 It should be noted that Mr. Henriquez has around 2 million shares currently valued at almost $25 million which is much more than the interim CEO and Board of Directors as shown below. What Can The Board Do From Here? The Executive’s employment may be terminated by the Company prior to the occurrence of a Change in Control at any time and the Executive will be entitled to the benefits provided by Section 4, provided the Executive has incurred a “separation from service” as defined in Section 409A, unless such termination is the result of the occurrence of one or more of the following events: “Cause” shall mean, with respect to the Executive: (II) the Executive’s conviction (or entry of a plea bargain admitting criminal guilt) of any felony or a misdemeanor involving moral turpitude. Clearly, Manny (Mr. Henriquez) is still important to the company and needed for the transition as he is very influential in the VC community. But it would be nice if the Board would do the right thing this time for shareholders including adjusting/canceling current and future stock option awards or even a potential clawback of shares and restricted stock units. As companies report results, closely monitor dividend coverage potential and portfolio credit quality. Identify BDCs that fit your risk profile. Establish appropriate price targets based on relative risk and returns (mostly from regular and potential special dividends). For updated HTGC target prices, dividend coverage and risk profile rankings, credit issues, earnings/dividend projections, quality of management, fee agreements, and my personal positions on all BDCs please see Premium Reports. As predicted in previous updates, BDC prices have rebounded strongly in 2019 with the average BDC up 15% as compared to the S&P 500 up 11%. I closely watch the yield spreads between BDCs and other investments including the ‘BofA Merrill Lynch US Corporate B Index’ (Corp B) that recently increased from 6.36% on October 1, 2018, to 8.45% on December 26, 2018. However, these yields have been declining in 2019 and are currently around 6.82%. 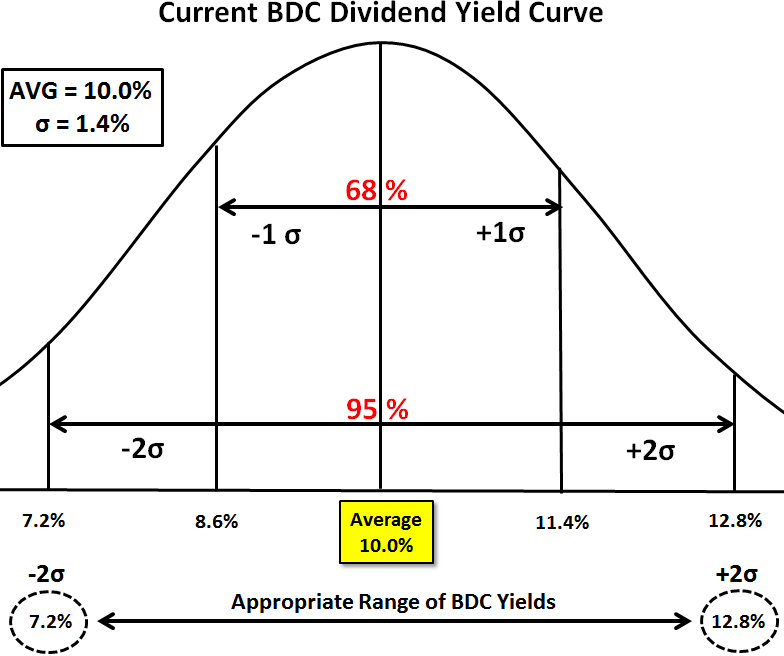 The average BDC dividend yield is almost 10.4% and 3.6% higher than Corp B implying neither oversold or overbought conditions. There is a chance for lower BDC prices potentially due to another ‘flight to safety’ and retail investor fear-related selling when they should be holding or buying. I’m closely watching various economic and BDC fundamentals as well as ‘Corp B’ effective yield spreads looking for oversold conditions. This update outlines the two most likely general market scenarios and my potential purchase plans over the coming weeks. Business Development Companies (“BDCs”) were down sharply through December 31, 2018, likely due to final tax-loss harvesting and/or year-end position changes in various investment funds. As predicted and shown in the chart below, “BDCS” has rebounded from the recent lows. During previous years, the average BDC stock price typically declined from December through January/February and then rallied through May/September. 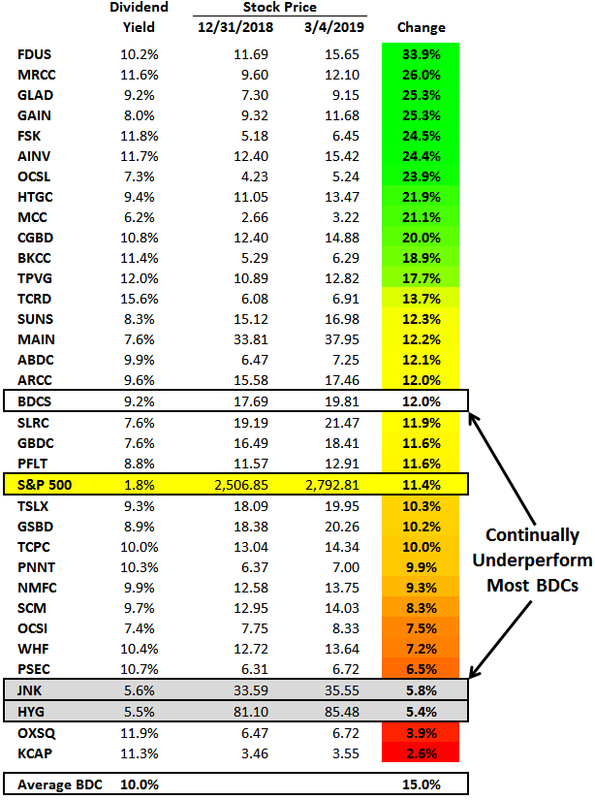 As predicted in the previous updates, most BDCs have been outperforming the S&P 500 so far in 2019, but still, have an average dividend yield of around 10%. The average BDC continually outperforms high-yield corporate bond ETFs such as the iShares iBoxx $ High Yield Corporate Bond ETF (HYG) and the SPDR Bloomberg Barclays High Yield Bond ETF (JNK), and UBS ETRACS Wells Fargo Business Development Company ETN (BDCS). It should also be noted that the following table does not take into account returns from dividends paid. BDC pricing is closely correlated to yield spreads including other non-investment grade debt and ‘BofA Merrill Lynch US Corporate B Index’ (Corp B). As shown in the chart below, I typically make multiple purchases when Corp B effective yields rise including January/February 2016, when the markets experienced concerns of slowing Chinese growth and increased energy sector defaults driving higher yield expectations, especially for non-investment grade debt. Also shown in the chart below, is the recent pullback in Corp B yields which is/was driving higher BDC pricing this year. The S&P 500 is still around 5% below its previous highs for various reasons, some of which are related to BDCs (including a potential economic slowdown), but the underlying fundamentals of the U.S. economy and BDCs remain strong. Continued/additional positive news regarding interest rate policy, U.S. and world economy driving a full rebound beyond previous levels where I will be making meaningful purchases on the way back up. BDC prices continue to rebound or at least remain higher through May or even as late as September and then back down through December/January. In this scenario, I will be making select purchases of underpriced BDCs and then waiting to make meaningful purchases. As discussed in the BDC Risk Profiles Rankings report, most BDCs have built their portfolios and balance sheets in anticipation of a recession with investments supported by high cash flow multiples and protected by protective covenants and first-lien on assets for worst case scenarios. I closely watch the yield spreads between BDCs and other investments including the ‘BofA Merrill Lynch US Corporate B Index’ (Corp B) that recently increased from 6.36% on October 1, 2018, to 8.45% on December 26, 2018. However, as discussed earlier, these yields have been declining in 2019 and are currently around 6.82%. This is meaningful for many reasons but mostly due to indicating higher (or lower) yields expected by investors for non-investment grade debt that will likely result in higher portfolio yields over the coming quarters. 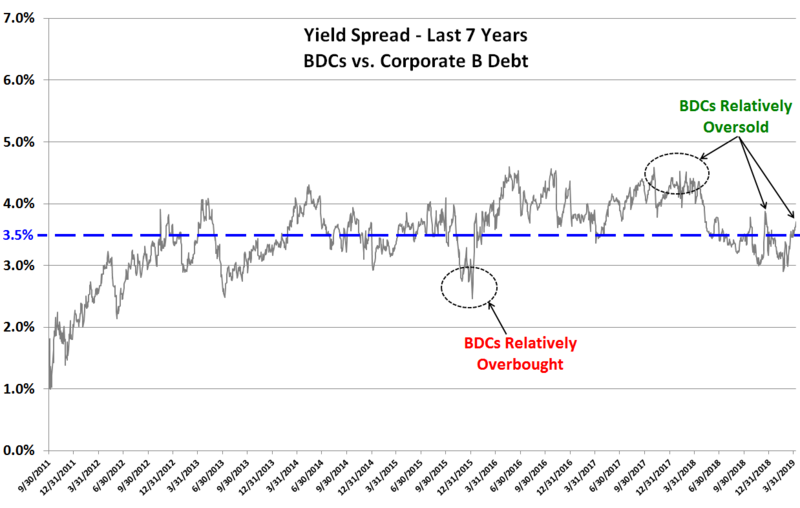 The following chart uses the information from the previous chart showing the average yield spread between BDCs and Corp B. I consider BDCs oversold when the yield spread is 4.0% higher and overbought when it is 3.0% lower. 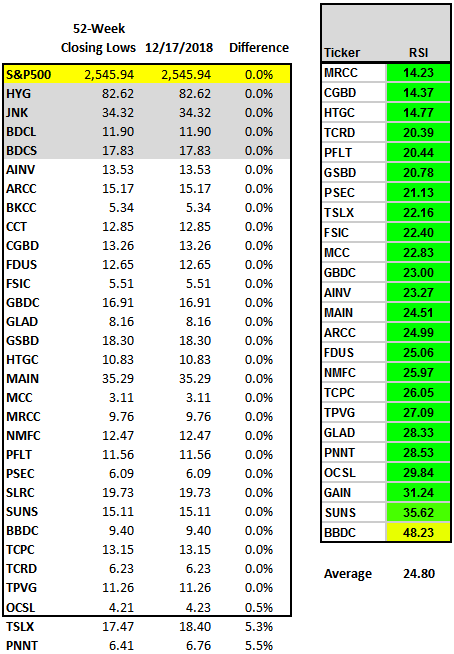 As shown in the chart below, BDCs are appropriately priced which is confirmed by the average RSI discussed earlier. 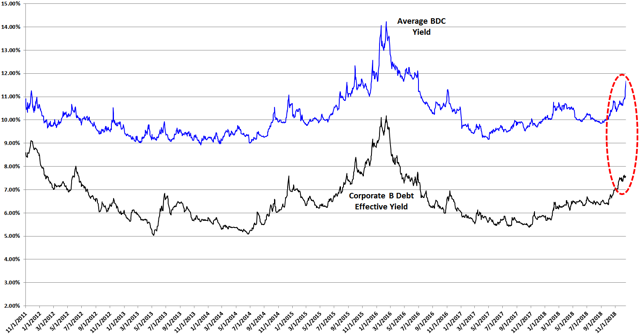 The average BDC is currently yielding around 10.4% compared to Corp B at 6.8% for a current yield spread of 3.6%. It is important for investors to understand that BDC pricing can be volatile which is a good thing for investors that watch closely and take advantage of ‘oversold’ conditions measured using various methods including RSI as shown in the BDC Google Sheets. This volatility drives very different returns depending on the time period used for measuring rather than using actual purchase prices. 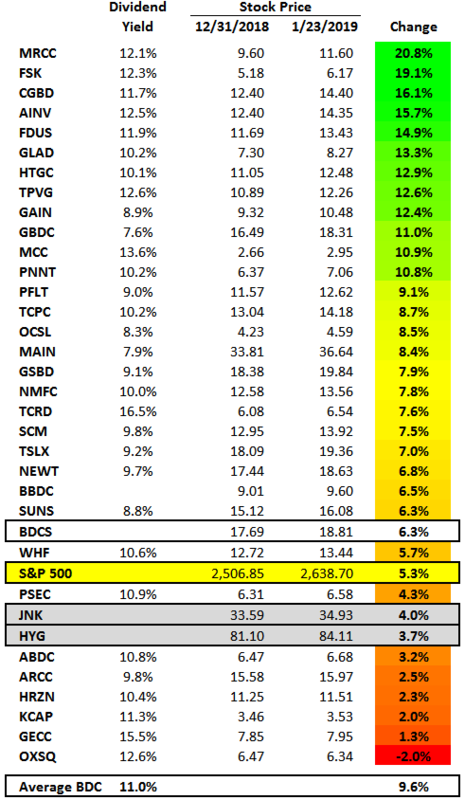 I mostly cover stable predictable BDCs that hopefully require minimal trading for investors with the exception of buying more on the dips as I have done with my personal portfolio and discussed in the BDC Buzz Positions report. I will expand on this report to include my actual purchases as well as Suggested Portfolios with commentary. Is FS KKR Capital’s 12.2% Yield At Risk? Explanation of total returns: The Change in Price assumes you purchased the stock at the end of 2018. Dividends do not assume reinvestment and are calculated using the amounts paid (or accrued) divided by the purchase price. Most BDCs were down sharply on December 31, 2018, likely due to final tax-loss harvesting and/or year-end position changes in various investment funds. As shown in the chart below, “BDCS” has rebounded from the recent lows. During previous years, the average BDC stock price typically declined from December through January/February and then rallied through May/September. However, it should be pointed out that BDC pricing is closely correlated to yields spreads including other non-investment grade debt and the ‘BofA Merrill Lynch US Corporate B Index’ (Corp B). As shown in the chart below, I typically make multiple purchases when Corp B effective yields rise including January/February 2016, when the markets experienced similar concerns of slowing Chinese growth and increased energy sector defaults driving higher yield expectations, especially for non-investment grade debt (Junk bonds suffer a rare negative return in January). This also resulted in wider interest rate spreads and favorable lending conditions. Higher quality BDCs typically have much higher portfolio growth during these periods as they take advantage of higher market yields. 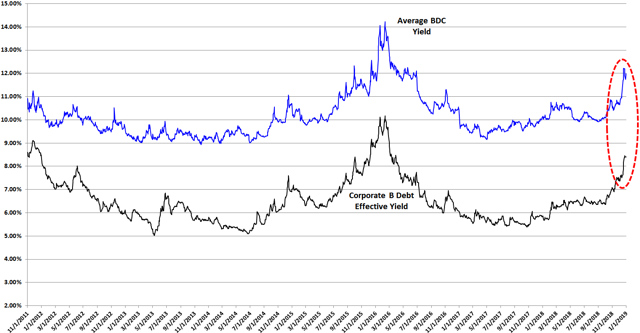 Also shown in the chart below, is the recent pullback in Corp B yields which was driving higher BDC pricing this month. ‘Dead cat bounce’ where stock prices continue to rebound but then continue back down to previous lows. In this scenario, I will be making select purchases and then waiting to make meaningful purchases of many BDCs likely in late February 2019. A solid round of good news regarding interest rate policy, world economy and the end of the government shutdown driving a full rebound toward previous levels where I will be making meaningful purchases on the way back up. Actively purchase additional shares if economic and BDC fundamentals improve driving lower ‘Corp B’ effective yield. Hold current positions and wait if economic and BDC fundamentals decline driving higher ‘Corp B’ effective yield. As discussed in the BDC Risk Profiles Rankings report, most BDCs have built their portfolios and balance sheets in anticipation of a recession with investments supported by high cash flow multiples and protected by covenants and first-lien on assets for worst case scenarios. Many BDC industry participants have recommended that the SEC’s Division of Investment Management remove or alter the line item titled “Acquired Fund Fees and Expenses” (“AFFE”) that is currently required to be included in a BDC’s prospectus fee table. AFFE disclosure requires acquiring funds to aggregate and disclose in their prospectuses the amount of total annual acquired fund operating expenses and express the total amount as a percentage of an acquiring fund’s net assets. The calculation of AFFE typically results in an overstated expense ratio because an acquiring fund’s indirect expenses are often significantly greater than the expense ratio of the BDC. As a consequence, some index providers removed BDCs from their indices, causing a significant reduction in institutional ownership of BDCs. On September 4, 2018, The Coalition for Business Development, Apollo Investment Management, L.P., and Ares Capital Management LLC submitted an application requesting that the SEC issue an exemptive order exempting BDCs from the AFFE disclosure. On December 19, 2018, as part of the release for Rule 12d1-4 described below, the SEC formally requested industry suggestions to improve AFFE disclosure. The BDC market would likely be receptive if the SEC takes action with respect to AFFE disclosure in 2019. The Securities and Exchange Commission voted on December 19, 2018, to propose Rule 12d1-4 (proposed rule) and related amendments to the regulatory framework governing funds that invest in other funds (“fund of funds” arrangements). The proposed rule would allow a registered investment company or a business development company (acquiring fund) to acquire shares of any other registered investment company or business development company (acquired fund) in excess of the limitations currently imposed by the Investment Company Act of 1940 without obtaining individual exemptive relief from the SEC. The SEC is also proposing to rescind Rule 12d1-2 under the 1940 Act as well as most exemptive orders granting relief from sections 12(d)(1)(A), (B), (C) and (G) of the 1940 Act. Further, the SEC is proposing to make related amendments to Rule 12d1-1 and Form N-CEN. Although the proposed rule would allow fund groups to establish fund of funds arrangements without undergoing the costly and time-consuming process of obtaining individual exemptive relief from the SEC, the proposed rule and related amendments would, if adopted as proposed, limit a number of the fund of funds arrangements currently in place (namely, certain three-tiered fund of funds arrangements). However, the proposed rule would also permit new types of fund of funds arrangements, including fund of funds arrangements involving listed and unlisted business development companies (BDCs) and closed-end funds. The comment period for the proposed rule is 90 days following its publication in the Federal Register. As of the date of this OnPoint, the proposed rule has not yet been published in the Federal Register. On Wednesday, a series of purchasing managers’ indexes for December mostly showed declines or slowdowns in manufacturing activity, including much of Europe and Asia as the U.S.-led trade war and a slowdown in demand hit production. U.S. activity was a bit slower, but still expanding, in a sign that China has suffered more from trade issues than the U.S. The S&P 500 has declined by over 15% over the last three months for various reasons, some of which are related to BDCs (including a potential economic slowdown), but the underlying fundamentals of the U.S. economy and BDCs remain strong. 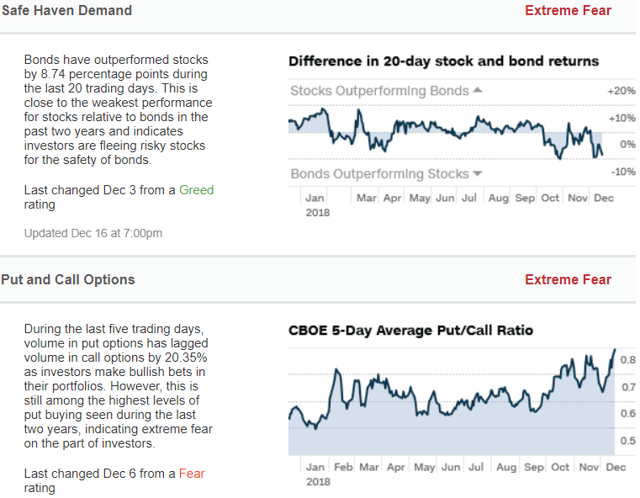 In January/February 2016, the markets experienced similar concerns including slowing Chinese growth and increased energy sector defaults driving higher yield expectations, especially for non-investment grade debt as shown in the chart below (see Junk bonds suffer a rare negative return in January). This also resulted in wider interest rate spreads and favorable lending conditions. Higher quality BDCs typically have much higher portfolio growth during these periods as they take advantage of higher market yields. ‘Dead cat bounce’ where stock prices start to rebound but then continue down. In this scenario, I will be making select purchases and then waiting to make meaningful purchases of many BDCs likely in late January or February. Continued market declines through January/February 2019 where I will be waiting for the selling pressures to abate before making multiple purchases. A solid round of good news regarding interest rate policy and the economy driving a full rebound toward previous levels where I will be making meaningful purchases on the way back up. 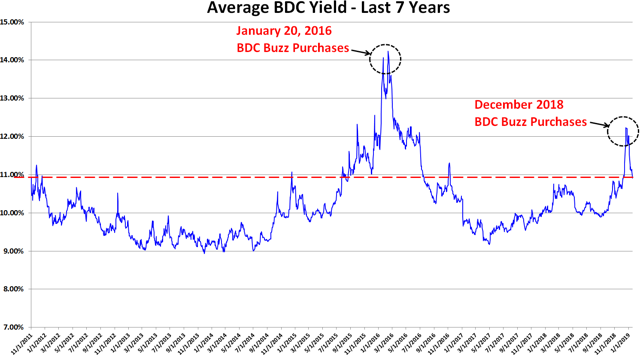 As predicted in previous updates, BDC prices continued lower and as shown in the chart below, “BDCS” is now near the previous lows from January/February 2016. Also shown in the chart, the average BDC stock price typically declines from December through January/February and then rallies through May or September. Clearly, this could be coincidence but BDCs are largely retailed-owned and pricing often does not follow the fundamentals which are strong as most companies are beating expectations, with higher NII/NAV and special dividends. 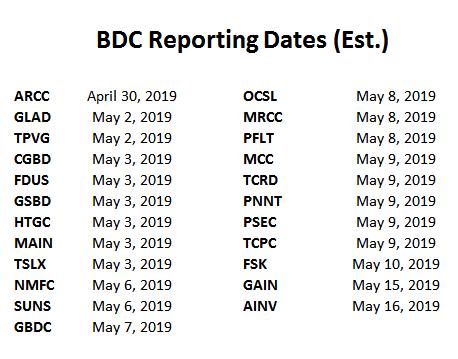 There have been a handful of BDCs reporting new credit issues including MRCC, FSIC, TCRD but I view these idiosyncratic. There is a good chance that I will be holding off on making significant purchases until February 2019 but could make smaller individual purchases over the coming weeks. I closely watch the yield spreads between BDCs and other investments including the ‘BofA Merrill Lynch US Corporate B Index’ (Corp B) that has increased from 6.36% to 8.40% since October 1, 2018. This is meaningful for many reasons but mostly due to indicating higher yields expected by investors for non-investment grade debt that will likely result in higher portfolio yields over the coming quarters as discussed earlier. 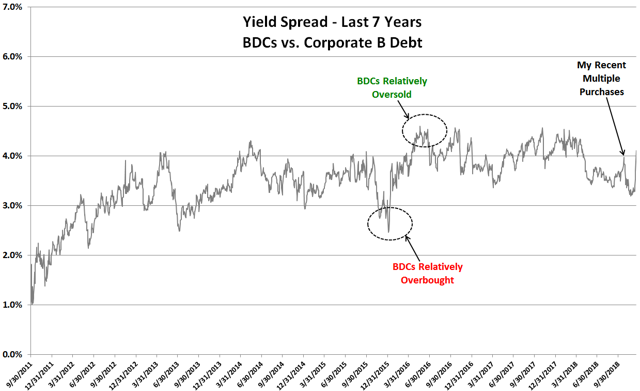 I consider BDCs oversold when the yield spread is 4.0% higher and overbought when it is 3.0% lower. ‘Dead cat bounce’ where stock prices start to rebound but then continue down. In this scenario, I will be making select purchases and then waiting to make meaningful purchases of many BDCs likely in January/February 2019. A solid round of good news regarding interest rate policy and the economy driving a full rebound back to previous levels where I will be making meaningful purchases on the way back up. 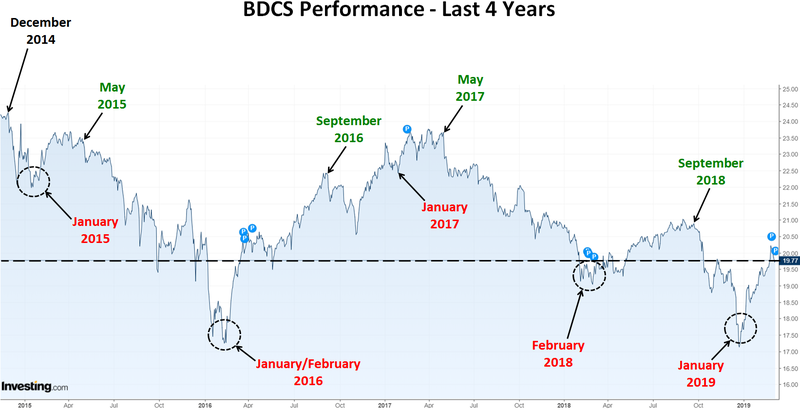 As shown in the chart below, the average BDC stock price typically declines from December through January/February and then rallies through May or September. Clearly this could be coincidence but BDCs are largely retailed-owned and pricing often does not follow the fundamentals which are strong as most companies are beating expectations, with higher NII/NAV and special dividends. 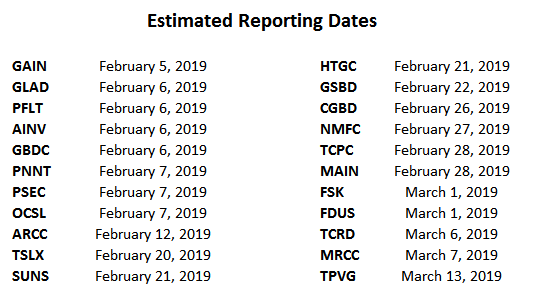 There have been a handful of BDCs reporting new credit issues including MRCC, FSIC, TCRD but I view these idiosyncratic. There is a good chance that I will be holding off on making significant purchases until January but could make smaller individual purchases over the coming weeks. I am expecting continued lower BDC prices partially due to tax-loss harvesting and then retail investor fear-related selling. These are the “chicken little” sellers fearing the worst and selling when they should be buying. 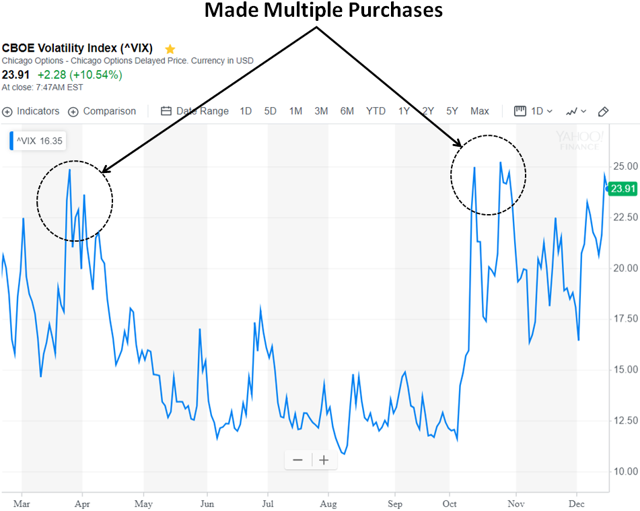 As shown below, the volatility index is approaching levels where I like to make multiple purchases similar to earlier this year discussed in the BDC Buzz Positions report. The following table shows the current pricing for each BDC compared to the closing lows over the last 52 weeks. 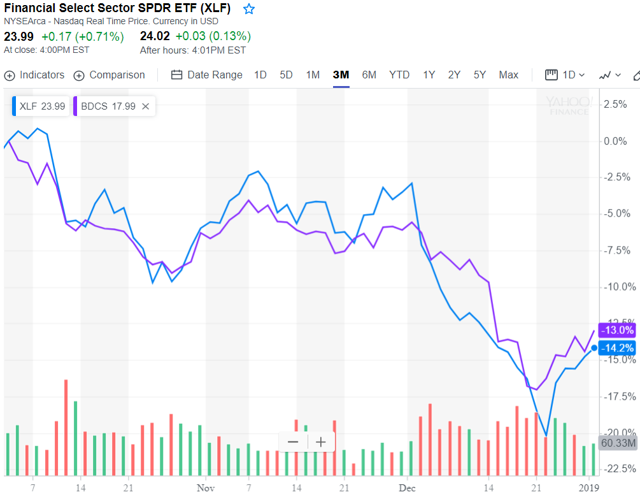 As you can see, most companies are trading at new lows as well as the S&P 500 and high-yield corporate bond ETFs such as the iShares iBoxx $ High Yield Corporate Bond ETF (HYG) and the SPDR Barclays High Yield Bond ETF (JNK). Also, the average RSI is now below 25 indicating that BDCs are seriously oversold. As mentioned in previous updates, we have recently experienced windows of wider interest rate spreads for non-investment grade debt and higher quality BDCs typically have much higher portfolio growth during these periods as they take advantage of higher market yields. This drives counter-intuitive pricing and is usually the time when investors are discounting pricing for BDC stocks. I closely watch the yield spreads between BDCs and other investments including the ‘BofA Merrill Lynch US Corporate B Index’ (Corp B) that has increased from 6.36% to 7.57% since October 1, 2018. This is meaningful for many reasons but mostly due to indicating higher yields expected by investors for non-investment grade debt that will likely result in higher portfolio yields over the coming quarters as discussed earlier. 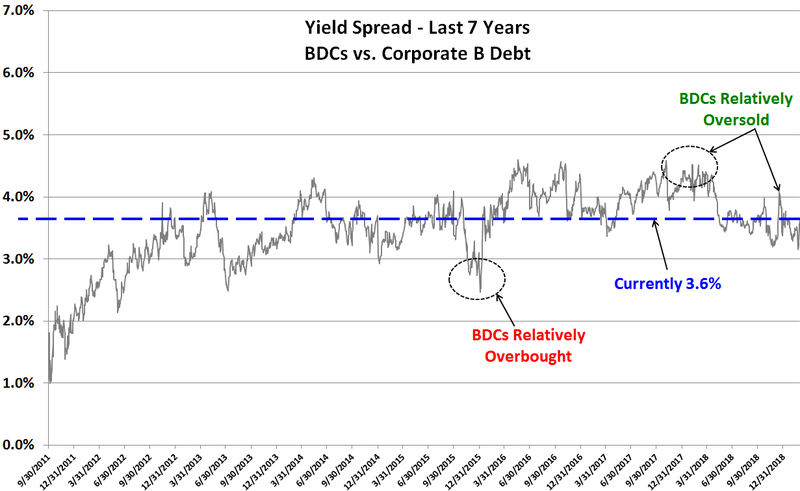 The following chart uses the information from the previous chart showing the average yield spread between BDCs and Corp B. I consider BDCs oversold when the yield spread approaches 4.0% higher and overbought when it is closer to 3.0%. 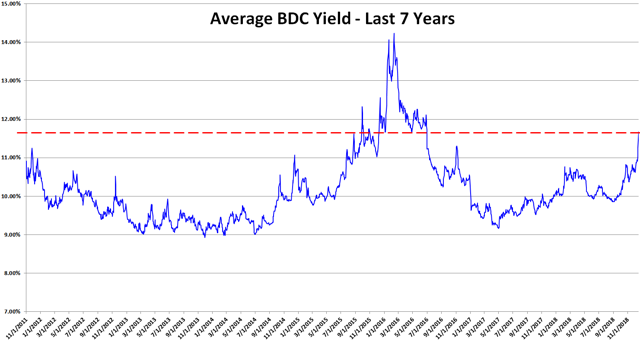 As shown in the chart below, my recent purchase of multiple BDCs in October 2018 was the last time the yield spread was 4.0% but is now again these levels. 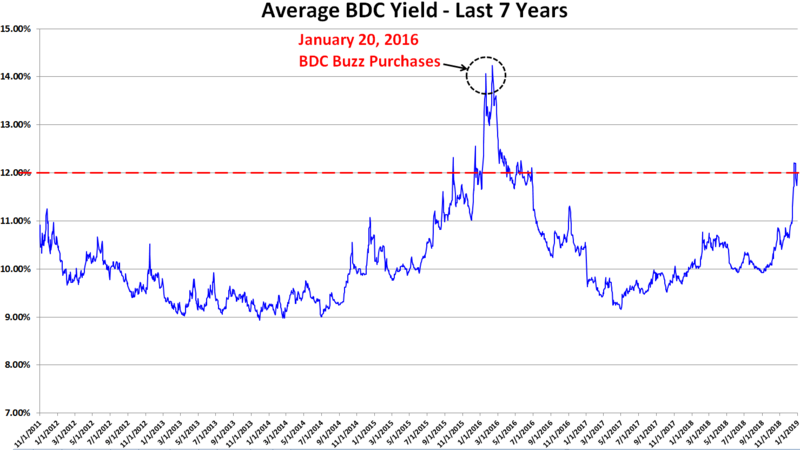 The average BDC is currently yielding around 11.68% compared to Corp B at 7.57% for a current yield spread of 4.1% and I will be making purchases of individual BDCs over the next few weeks as discussed earlier and in the Upcoming BDC Buzz Purchases: December 2018 report. 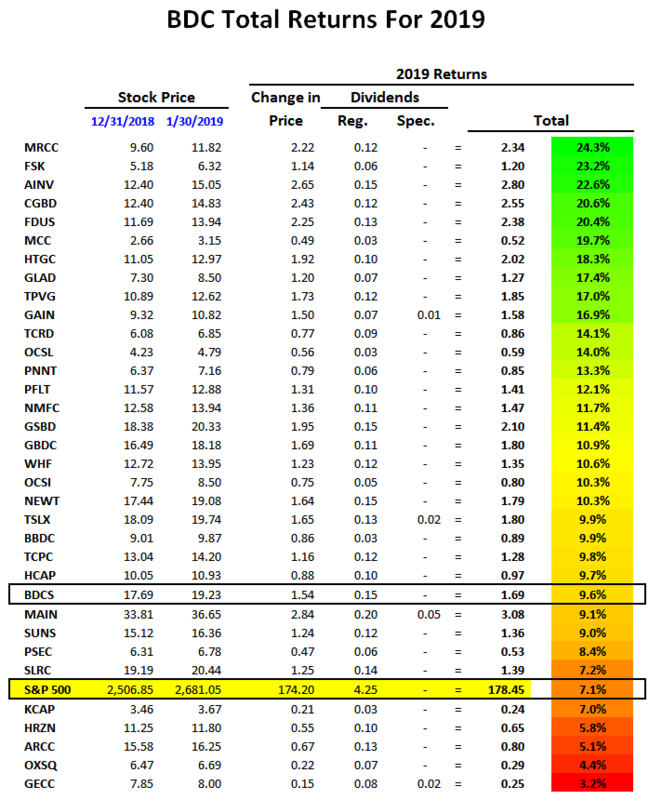 The following is a quick update that was previously provided to subscribers of Premium Reports along with target prices, dividend coverage and risk profile rankings, credit issues, earnings/dividend projections, quality of management, fee agreements, and my personal positions on all BDCs (including this one) please see Deep Dive Reports. As predicted in the recently updated CGBD Deep Dive report, CGBD announced a special dividend of $0.20 per share yesterday payable on January 17, 2019 to stockholders of record as of December 28, 2018. “We are pleased to announce a year end special dividend to our shareholders of $0.20 per share. We have also paid/declared $1.48 per share in regular dividends in 2018 year to date.” commented Michael Hart, Chairman and Chief Executive Officer. On June 6, 2018, CGBD had its 2018 Annual Shareholder Meeting and the Board was asking stockholders to approve the application of the 150% minimum asset coverage ratio. As shown below, the “required majority” of shareholders voted for Proposal 3 and the 150% minimum asset coverage ratio became effective as of June 7, 2018. What does this mean for shareholders and upcoming dividend coverage?